Apple pomace (Malus domestica Borkh.) 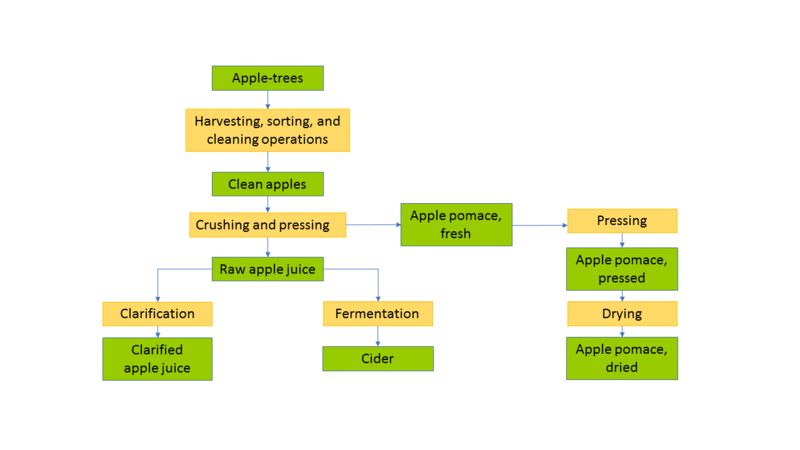 is the solid residue that remains after milling and pressing of apples for cider, apple juice or puree production (Givens et al., 1987; Kafilzadeh et al., 2008). Culled, dropped and damaged apples (broken, injured during plucking, unfit for packing) are available in plenty during the apple season and are sometimes used for feeding livestock (NDDB, 2012). Apple pomace contains peel, flesh, stem, core, seeds and juice residues (Sudha et al., 2007; Crawshaw, 2004). A sample of apple pomace was reported to contain 54% pulp, 34% peel, 7% seeds, 4% seed core and 2% stem (Kolodziejczyk et al., 2007). Fresh apple pomace contains 15-30% DM and pressed pomace 30-40% DM. Fresh apple pomace is bulky with the density ranging between 400 and 1000 kg/m3 (Kennedy et al., 1999). Density and moisture content depend on processing methods and apple maturity. Apple pomace is a multipurpose product with many uses including fuel (ethanol production), direct burning, gasification, anaerobic digestion (methane generation), food (pomace jam, sauce, confectionery products such as pomace powder for toffees), pectin production, citric acid production, fibre extraction, and livestock feed (Shalini et al., 2010; Stapleton, 1983). Apple pomace is a succulent fibrous feed that has been a traditional feed for all kinds of livestock for a long time (Leroy et al., 1955). Apple pomace is used fresh in the vicinity of apple processing plants. Because of its high moisture and high content in fermentable sugars, fresh apple pomace spoils readily and is often ensiled or dehydrated for longer preservation (Shalini et al., 2010; Crawshaw, 2004). Apples are the second fruit crop worldwide after bananas. In 2016, 82 million t were produced in the world: 70 million t were directly used for food, 5.8 million t were processed, 7 million t were wasted and 0.66 million t were used as feed. The main producers were China, the USA, Turkey, Iran and Poland (FAO, 2018). As apple pomace represents about 25% of apples processed for juice or cider, it can be estimated that 1.4 million t of fresh apple pomace were produced in 2016. In France, where apple production was about 1.8 million t in 2012, it is considered that a third of the production is processed into juice or cider, resulting in about 150 000 tons of pomace (FNPF, 2016). In Brittany, France, cider mills produce about 8700 t DM of apple pomace per year, as well as small quantities of culled apples (Roy et al., 2013). India produces 1 million t of apple pomace yearly, but only 10,000 tons are used as feed (Shalini et al., 2010). Apple pomace can be found in every temperate area where apple trees are grown. Because it spoils easily, apple pomace is mainly used in the vicinity of apple juice or cider plants. Apple pomace is usually a seasonal product available after the harvest in autumn (Roy et al., 2013). Fresh apple pomace spoils quickly. Even when it is intended to be fed fresh, it is recommended to exclude air by consolidating and sheeting (Hall, 2014). Apple pomace can be preserved for long-term storage by ensiling as if it was grass. It is recommended to mix it with dry materials such as rice hulls or straw to absorb the leachates produced during fermentation and to limit effluent losses (Perry et al., 1995; Alibes et al., 1984). Air should be removed by compacting the silo using a tractor and then covering it with a clean and undamaged plastic sheet. When feeding starts, it is advisable to expose 2-3 days usage at a time to prevent air from getting under the sheet (Hall, 2014). 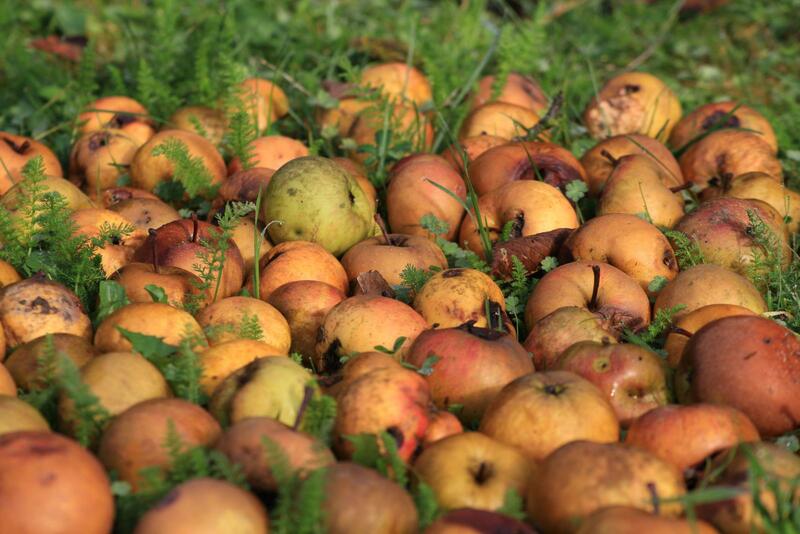 Ensiling apple pomace may result in production of ethanol, which may cause health problems if animals are fed it over long periods (Crawshaw, 2004). Fresh apple pomace contains large amounts of water. The first step of the drying process is to put the pomace on a slanted surface so that excess water can drain away. The pomace can then be pressed through a filter press and dried in thin layers by hot air circulation, or through sun-drying by spreading it on a concrete floor in a 5-7 cm thick layer exposed to the sun and turning 2-3 times a day till DM reaches 90%. In hot climates where temperatures reach 40-45°C, only 3 days are necessary for dehydration. Once dry, the apple pomace is ground in a mill (1-2 mm screen) and stored in polyethylene bags (Wadhwa et al., 2013). Apple pomace is a waste product occasionally disposed of by dumping in fields or next to processing plants. It is rapidly biodegradable, with a high biochemical oxygen demand (BOD). Its high water and fermentable sugar contents result in quick spoilage causing pollution, and using apple pomace for feeding livestock is a way to alleviate this problem (Crawshaw, 2004). Alternative methods for disposing of apple pomace include composting, fuel production, and spraying it as mulch for landfilling or landspreading (Shalini et al., 2010; Linskens et al., 1999; Copas, 2004; Stapleton, 1983). Apple pomace is a valuable source of mulch or compost (Copas, 2004). Composting should be done in combination with a source of C in order to get an adequate C:N ratio for composting. In the UK, apple pomace was shown to be effective in suppressing weeds, and could be a valuable substrate for grass seed germination in difficult areas such as roadsides (Copas, 2004). Apple pomace is an extremely variable product, probably due to large variations in the proportion of skins, pulp, core, seeds and juice in the by-product. The composition of apples themselves is variable and depends on the variety, maturity, season of harvest, etc. (Grigoras, 2012). Apple pomace is generally poor in protein (3-11% of DM) and rich in fibre and sugars. Crude fibre ranges from 18 to 50% of DM, NDF from 48 to 75% of DM, ADF from 36-67% of DM and lignin from 16-35% of DM. Sugar content is also variable: apple pomace is high in fructose (14 to 35% of DM). Saccharose and glucose contents are lower but also variable: 1-11% and 6-13% of DM, respectively (Gullon et al., 2007; Kennedy et al., 1999; Kolodziejczyk et al., 2007). It should be noted that the sugar contents reported by regular methods of feed analysis are usually low (about 6% of DM). Ethanol is the main fermentation end product in apple pomace silage, with reported ethanol content as high as 17% of DM. It had thus been recommended to limit the quantities of pomace fed to livestock, or to feed it for relatively short periods (Alibes et al., 1984). In a silage made of whole, crushed apples, the ethanol level reached 22-29% of DM, which may have been caused by yeast alcoholic fermentation. It was impossible to decrease the pH, and the silage could not reach a stable state: it was, therefore, recommended to add a dry and fibrous material such as straw up to 30% of the DM (Rodrigues et al., 2008). Culled apples and apple pomace include the skin, which retains a substantial proportion of the residues of lipophilic pesticides (Amvrazi, 2012). Ingested pesticides can be stored in fat tissues (Rumsey et al., 1977) and in milk, although at low levels (Chase et al., 1987). Hundreds of pesticides are registered and in use for apple production all over the world (up to 799 in the USA) (Drogué et al., 2012), and pesticide residues have been reported in several recent studies (Lozowicka et al., 2015; Pogăcean et al., 2014; Likudis et al., 2014; Szpyrka et al., 2013; Jardim et al., 2012; Latif et al., 2011). Although in most cases the contents of residues were below the Maximum Residue Levels established by local regulation, some have been found beyond this threshold. Residues observed on fresh fruits may not be present at the same level after fruit processing, because fruits are washed and brushed before being pressed. If apple pomace is to be used in ruminant feeding it must be verified that the level of pesticide residue is low. According to the Codex Alimentarius, the Maximum Residue Levels in dry apple pomace are 0.3 mg/kg for Fenarimol, 40 mg/kg for Fenbutatin Oxide, 120 mg/kg for Permethrin and 80 mg/kg for Propargite (Codex Alimentarius, 2003). Like other fruits, apples can be dangerous to cattle and sheep when swallowed whole, as they may lodge in the oesophagus, causing obstruction. Cattle grazing in apple orchards are at risk as they are fond of picking apples hanging from the lowest branches (Tran, personal communication). Apple pomace and whole apples contain high amounts of sugars (mainly fructose and glucose) and are, therefore, a good source of rapidly digestible energy in the rumen (Gullon et al., 2007; Kolodziejczyk et al., 2007). Because of its low nitrogen content and intake level when fed alone, apple pomace (fresh, dried or ensiled) must be supplemented with a good protein source and fibrous material such as straw. It is not recommended to use it alone. Apple pomace and culled apples are palatable to ruminants (NRC, 1983; NDDB, 2012). Cattle grazing in apple orchards are fond of picking apples directly from the trees (Tran, personal communication). The in vitro DM degradability of fresh apple pomace is high at around 75% (Edwards et al., 1995). In sacco DM degradability (DMD) of fresh apple pomace ranged from 77 to more than 90% after 24h incubation (Anrique et al., 2002; Kafilzadeh et al., 2008 ). After 42 or 48h incubation DMD ranged from 84 to more than 90% (Kafilzadeh et al., 2008; Anrique et al., 2002). Dried and ensiled apple pomace gave similar values with 67-73% after 24h and 82-84% after 42 or 48h (Singh et al., 1992; Anrique et al., 2002). The potential degradability of fresh apple pomace measured with the gas production method showed a rapid degradability with 86% within 24h and 98% after 48h incubation (Tagliapietra et al., 2015). All these measures confirm that apple pomace DM is rapidly degradable, which is explained by its high soluble fraction. In vivo OM digestibility of apple pomace silage supplemented with nitrogen (soybean meal, alfalfa or urea) when measured on sheep ranged from 70 to 78% (Alibes et al., 1984), which is in agreement with the above in vitro values (Alibes et al., 1984). The in vivo DMD and OMD of dried apple pomace, measured in sheep with only urea as a supplement, was relatively high with 66.8% and 69.9%, respectively (Taasoli et al., 2008). Based on in vitro digestibility estimates, apple pomace could fully replace barley as an energy source in an alfalfa hay based diet (Khatooni et al., 2014). Figure 1: DM degradability of fresh, ensiled or dried apple pomace measured with the in sacco method (adapted from Singh et al., 1992; Anrique et al., 2002; Kafilzadeh et al., 2008). Apple pomace (fresh or as silage) can be introduced at up to 30% in a dairy cow diet fed indoors or at pasture. It increases total DM intake, milk yield and milk composition (see Table 1 below) with no apparent adverse effects. Apple pomace replaced half of maize grain in a diet for steers based on good ryegrass forage (Ribeiro et al., 2012). When offered to 175 kg calves as sole feed, supplemented with only minerals, dried or fresh apple pomace DM intake and digestibility were 1.21 and 1.98% of body weight and 43.8% and 57.8%, respectively (Singhal et al., 1991). In India, ground and dried apples were incorporated as an energy source at up to 30% of the concentrate mixture of crossbred calves, thereby totally replacing the maize (NDDB, 2012). Apple pomace silage used as fibrous feed during the gestation of beef cows should be supplemented with a protein supplement rather than with non-protein supplement, as the cows supplemented with non-protein supplements had calves that, although born alive, were lighter, weaker, and had skeletal abnormalities. Besides, calf mortality was increased (Fontenot et al., 1977). 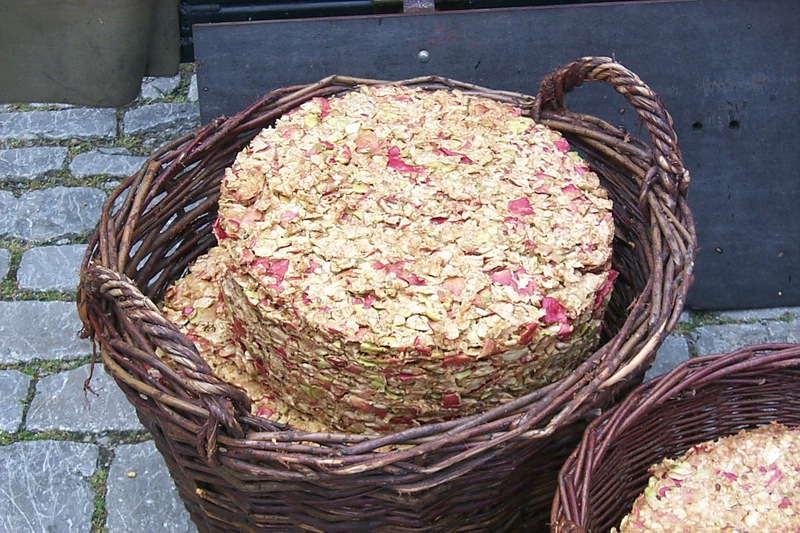 When fresh apple pomace was included at increasing levels (5 to 20% on a DM basis) into a total mixed ration (TMR), prepared as silage and offered to beef cows, the DM and OM digestibility of the TMR tended to decrease from 53 to 51% and from 58 to 55.4%, respectively, with increasing levels of apple pomace (Fang et al., 2016). As observed with cows, fresh or dried apple pomace supplemented with urea did not meet the requirements for gestating ewes. Compared to a control diet, there were more stillbirths, birth weights were lower, lamb survival was poor and there were structural abnormalities. Supplementing apple pomace with a good protein source (soybean meal) and fibrous feed (straw or forage) improved or alleviated these negative effects (Rumsey et al., 1982). Dried or ensiled apple pomace included into a total mixed ration at 20 or 30% allowed a good daily weight gain in fattening lambs and a higher carcass dressing percentage (Taasoli et al., 2008). In sheep, diet DM intake tended to be higher when apple pomace was supplemented with a good quality nitrogen such as alfalfa (55.4 g/kg0.75), rather than with urea (38.7 g/kg0.75) (Alibes et al., 1984). Early experiments found that apple pomace was a good feed for pigs. Growing and finishing pigs were fed 20% dried apple pomace in the diet without compromising growth performance, carcass characteristics and animal health (Bowden et al., 1959). Ensiled apple pomace was found to be palatable to pigs though it ranked last after concentrate feeds and ensiled cooked potatoes (Leroy et al., 1954). In a more recent experiment, feeding growing pigs with dried apple pomace (23% of the diet) reduced the protein content of the diet and thus decreased overall losses of N, but the crude protein intake was reduced by 33%, and protein digestibility was only 51% instead of 81% in the control diet (Yamamoto et al., 2002). Ensiled apple pomace included at 5% (diet DM) of growing pig diets had no effect on growth performance and improved the gain:feed ratio. It had negative effects on meat quality: it decreased water holding capacity, increased cooking loss and increased polyunsaturated fatty acids, which are responsible for soft fat. The amount of apple pomace and the length of the feeding period should thus be considered when feeding pomace to pigs (Fang et al., 2016). Fermenting apple pomace using fungi improved crude protein content by 36%. The enriched apple pomace was included at 5% of growing pig diets and improved their feed conversion ratio (Ajila et al., 2015). Apple pomace has been investigated as a source of beneficial proanthocyanidins and flavonoids. Feeding piglets a diet containing 3.5% (DM basis) apple pomace increased the number of colonic bacteria (Lactobacilli) and positively influenced the white blood cell mRNA, the gene expression marker of immunological genes (Sehm et al., 2011). A fermented apple diet based on dropped apples, rice bran and barley bran was offered to finishing pigs at 2% of diet DM over five weeks without affecting feed intake, animal performance and carcass quality (Lee et al., 2009). Literature regarding the use of apple pomace as a feedstuff for poultry is scarce. Because of its low protein and high fibre and water contents, fresh apple pomace can only be used as an energy source for broilers. Apple pomace has been tested in mixture with wheat, fine bran, carobs and fat to replace maize and reduce feed costs in broiler diets (El Boushy et al., 2000). However, in 2001, it was shown that dried apple pomace coud be used to replace 10% of maize in broiler rations. Beyond this 10% level, apple pomace resulted in wet litter, and depressed feed efficiency mainly due to high fibre content. It was also shown that the addition of enzymes (α-amylase, hemicellulase, protease and β-glucanase) resulted in better animal performance when apple pomace was offered to broilers (Matoo et al., 2001). Dried, ground damaged apples could replace 20% of maize in broiler rations without any harmful effect, and thus decrease feed cost (Matoo et al., 2001). Fresh apple pomace from farm-produced apple juice and cider was observed to be palatable to ducks (Tran, personal communication, 2016). In Europe, dried apple pomace is a common ingredient used in formulation of balanced rabbit feeds (Schurg et al., 1980; Fekete, 1985; Gippert et al., 1988; Carabaño et al., 1992). In commercial as in control diets, the incorporation level is generally comprised between 5% and 10% as a source of soluble fibre (Gómez-Conde et al., 2007; Pogány Simonová et al., 2009; Chrastinova et al., 2010). The incorporation level could be safely increased up to 30% if the diet contains enough low digestibility fibre (ADF, ADL) (Sawal et al., 1995; Alvarez et al., 2007; Abad-Guamán et al., 2015; Gidenne, 2015). It should be noted that the increase of dietary fibre content with apple pomace improves the n-6:n-3 ratio of muscular fatty acids of growing rabbits (Carrilho et al., 2009). The incorporation level of dried apple pomace is limited by the very low content in both digestible protein (2-3%) and digestible energy (about 7 MJ/kg DM) (INRA, 1989). Some attention should also be paid to the very low content in phosphorus (0.12%), and particularly calcium (0.13%) (Waller, 2010). In rabbit feeding, dried apple pomace must be considered only as a safe source of soluble (digestible) fibre, and needs to be supplemented with other ingredients. Apple pomace is very palatable to horses. It is often offered as horse treats alone, or in mixture with oats (Worth, 2010). Apple slices are also often used in the preparation of horse treats. Apple pomace was used as a substrate for solid state fermentation and production of protein enriched feed for tilapia fry. The fry fed the experimental diet had 44% higher growth than those fed the control diet (Vendruscolo et al., 2009).